There are various ways of putting copyright notices on your blogs including typing your own and if you want to include the © symbol, you will have to use the code to display the © symbol. For clearer explanation, refer to How to put a copyright notice to your blog. This post was written for the old classic Blogger template, but you can modify it for the New Blogger if you know how New Blogger works. If not, refer to the bottom section of this post. If your blog content has been copied, or you want a way to discourage would-be copycats, refer to this post: What to do if your blog content is copied, or you want to warn off would-be copycats (click BACK button to get back to this page). Anyway, there is an easier way and a way to do copyright notice which can enable you to keep the copyright notice up-to-date automatically, and that is to use this copyright notice generator: Automatic always up-to-date copyright notice generator. I have used it to generate a copyright notice for this blog: Dummies Guide to Google Blogger. The copyright notice is at the footer of the blog. If you return to the blog next year, you will see that notice updated to year 2008. I think I will probably do the same thing for my other blogs, including this one. New Blogger has introduced private blogs where you can set the blog to be viewable by those you invite or by blog authors. However, Blogger have left out one thing, that is to make provision for private blog owners to enable people to request for an invitation. I have found a way around that. The only thing is, you will have to accept some changes to the appearance of your private blog. What you can do is to add to the title of the blog a message such as (email xyz@gmail.com for invitation) and any other information that you may want, example, amplify the message a bit by adding "Please give reasons why you want to view this blog" or something similar. The only thing to remember is if you give the email address as shown, it may be harvested by bots for spam. I have a email me link in this blog which can also be harvested for spam, but I don't care because the email address I provided in the mailto: HTML to display the email me link is a special gmail address made for such purpose, and my experience is all the spam messages go into the spam filter, and I do not get spam messages in my Inbox. If you are worried, perhaps you can write the email address as xyz at gmail dot com. You can see an example in this test blog: Peter's Private Blog. To change the title, click SETTINGS > BASIC in the Dashboard. Refer to Simple adjustable way to hide Navbar for an easier way to hide the Navbar. Also see earlier update at the bottom of the post. 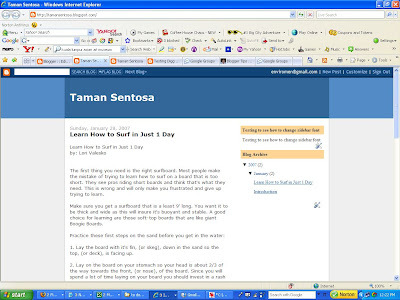 The navbar is compulsory for bloggers using blogspot.com for their blogs, and it can also be useful. It has a search box which will allow visitors to search the content of your blog. You can also change the color of the navbar to blend with the colors of your blog by going to the LAYOUT and right at the top, you will see a section for navbar. Click EDIT and chose the color for the navbar. However, many people have expressed the desire to remove the navbar as there is "Next Blog" in the navbar which when click will lead to an unpredictable blog which may contain sexually explicit content, etc and about which people like educators who set up blogs for their students are very unhappy about. Update 29 July 2007: Accoring to Kawaljit of Maybe it is OK to remove Blogger navbar, Google did a series of road show in some Indian cities to promote their Blogger platform. Ankit attended the event and asked for clarification on the navbar policy from the Google representatives at the roadshow. They called up their office in Bangalore office and confirmed that it's legal to hide the navbar. If you really want to hide the navbar, this is how to go about it. Whenever you make changes to the template, it is always wise to backup the template first. If you are not familiar with that, refer to this post: Backing up and changing New Blogger template. Preview, and if satisfied, click "Save Template". To demonstrate, I will hide the navbar from this blog DIY (Do It Yourself) which is a blogspot blog. There are New Blogger templates by Final Sense which you get via links in New Blogger 3 column templates by Final Sense. Although there is a navbar Page Element in the Layout of the most blog templates, there are no navbar for blogs using Final Sense Color templates. So if you don't want a navbar, but have an excuse for it perhaps you may want to consider using Final Sense templates. Update 5 July 2007: A blogger commented this method don't seem to work anymore. I tested before I published and it work, but on getting him comment, I tested again and found that what he said was true. I have tested a slightly different way of doing it at Another way of hiding the navbar and found that the alternative way worked. So if you still want to hide the navbar, refer to the new post. Update: For this post you will need to know how to open the template editor and this post How to backup and edit template will show you how. A blog reader said he couldn't find a post for post description, and since it may involve a long reply, and it will benefit more if I answer in a post, I will write about it here. You can write meta tags on your own, but there are plenty of meta tag generators on the web and one of them is META Tag Builder. If you go to that site, all you need to do is to fill in the title of your blog, a description, keywords, email address, author, (leave the EXPIRES field blank), use the drop-down menu to select the language of your blog, then if you don't want search engine to spider your blog and/or the links to be followed, tick the box for NOFOLLOW, NOINDEX (I left this blank as I want my blog to be crawled by search engines and for the links in it to be followed), then just click the CREATE HTML button and the meta tags will be generated for you. Most of the above is optional and you can leave them out if you want. Alexa ranks sites based on visits from users of its Alexa Toolbar for Internet Explorer, so if your blog visitors don't have the Alexa Toolbar installed, your site wouldn't rank well for Alexa. According to Brett of Using Alexa redirect in your comments, you can improve your Alexa ranking by putting http://redirect.alexa.com/redirect? in front of your site's URL (Brett was referring to links in comments, but if you don't have the habit of making links to posts (however, see note below) in your other blogs open in new window, you should be able to use the same trick by doing the same thing for links in posts to improve your Alexa ranking, especially if you link to posts in your own blogs like I often do). Each click on the link will be counted by Alexa irrespective of whether the visitor has the Alexa toolbar installed. Testing Alexa redirect opening in new window. I don't know why I can add the target="_blank" attribute and get a different result in this post. If this behavior is consistent, looks like you can make links in posts open in new windows and still use the same trick. I will try it when I make new posts and see if I get the same result. If you use this trick in your posts, I hope you will let us know your experience by leaving a comment in this post. Anyway, it will make no difference if you do this in comments as target="_blank" is not allowed in comments. And anyone clicking on the link in the comment will contribute to improving your Alexa ranking. BTW if you don't already know it, the lower the Alexa ranking, the better it is for your site, just the opposite from PageRank. Note: I have made a few more links with this trick and included the target="_blank" and there were no problem. The link displayed as it should and also opened in new windows. However, if you use this trick, do check and ensure it is working as it should, and if it doesn't, please do leave a comment in the interest of all bloggers. Are you running a business? If so, advertising your business is a good way to get more business, and an old, effective way is to advertise your business by placing an entry in the Yellow Pages. But nowadays, how do people search for information? The answer for many people is that they use the Internet and the search engines. And search engines love blogs. There have been many times that I have started a blog and notice hits from search engines in my hit counter statistics not very long after I started the blog. Not only that, quite often, a particular post come up quite high in the search result page, and not infrequently in the first result. You should always have a hit counter installed to track visitors to your blog. See How to track visitors to your blog. This was written before New Blogger was introduced. It should still work, but it will add a visible counter at the bottom of the page. If you chose an invisible counter, it will make no difference, but if you want the visible counter elsewhere, or want an easier way, for instruction on how to install it for New Blogger by referring to Adding advertisement, hit counter, etc. to New Blogger blog (click BACK button to get back to this page). So if you run a business, start a website for the business plus do a blog to draw traffic to your business site. Note that the font has been changed to Times (you got to see the enlarged screenshot to see the difference, or surf over to Taman Sentosa to see the actual site. This is the way to do it. This involves opening the template editor and as always, backup the template before you make any changes. If you are not familiar with that, see the instructions at Backing up and changing New Blogger template. A better way to do it is to setup a virtual host in the domain, and publish the blog to the virtual host URL. Learn how to here. I have previously done a post for redirecting a blog to another site for the old classic Blogger at How to redirect from old URL to new URL. However, on testing, it was found not to work on the New Blogger blogs anymore, even with changes. This is the way to do it for the New Blogger. First thing to do always before you make any changes to the template is to backup the template PLUS the Page Elements. Some or all of your old Page Elements will be deleted or become empty when you upload a new or backup template. If you are not familiar with the method to do it, refer to Backing up and changing New Blogger templates. var url = "URL of where you want the blog to be redirected"
Make sure you replace URL of where you want the blog to be redirected with the actual URL of the site you want to redirect to. If you are not familiar with URL, refer to What is URL and how to get it. Update 5 August 2007: Two readers have complained of problems with this hack. I have taken the trouble to retest following exactly the instructions given above with a test blog Testing New Blogger Redirect. Update 1.9.2008: Apologies, I have unknowingly deleted the above test blog. But be assured that I have successfully tested the redirect. but click on the link and see where it eventually takes you. It will take a short interval before you get redirected. One think I suspect is they have left out the http:// from their URL. Note: See update at the bottom of the post. The New Blogger have added a Nofollow attribute into the template to prevent hyperlinks in the comments section from being followed by search engines. This is to discourage spammers from posting spam comments in Blogger blogs. However, if you, like me, often respond to comments with links to your own posts and/or add signature line with a link to your blog/blogs, that is a disadvantage to you, especially if you moderate your comments to weed out spam comments. By doing that, you allow search engines to follow links in the comments section and will help increase link popularity and PageRank. This will help you bring more traffic to your blog. This will involve tampering with the template of your blog, and a wise step to take is always to backup your template before you make any changes so that if anything goes wrong, you can always upload the backup template and you will be back to where you were. If you don't know how to backup your template, refer to this post: Backing up and changing New Blogger template. Delete the phrase rel='nofollow', preview to ensure everything is OK, then save the template. If you have problem finding that line of code, click inside the template editor window, then press ctrl+A (or click the beginning of the codes and keep pressed down the left while scrolling right to the bottom of the template editor window) to highlight all the codes. Right-click on the mouse and select "copy" to copy the whole template into clipboard, open Notepad and paste the template into Notepad. Click "Edit" in the menu bar at the top and chose "select all" to highlight the whole codes. Repeat again, but this time select "Find". Type of copy-paste part or whole of the line of code you want to edit into the "Find what" field, then click "Find next" and whatever you are trying to find will be highlighted. Do what is necessary (delete rel='nofollow'), highlight all the edited template again and copy into clipboard, go back to the template editor. The whole template should still be highlighted. Press the "Delete" key to empty the template window and paste the edited template into the window. Preview to make sure everything is OK, and if so, then save the template. UPDATE: I have checked Page Source of those blogs which have removed the "nofollow" attribute and the "notfollow" attributes are still existing in the Page Source thus indicating that this hack may not help. Got a question from a blog reader about how to go about finding the width of the blog Header, so I thought I might as well make a post to let more people know about it. These codes are from the template of this blog. The first block of codes tells me that the width of the Header is 750 pixels. The second block says the main column width is 400 pixels. The last two block of codes tells me that both the sidebars are of width 150 pixels. Here is where you can kill 2 birds with one stone. Help others and increase traffic to your blog. Try Yahoo Answers. Either look at the approprite category for your blog or type in keyword in the search box and look for people seeking answers. If you have a post address the question, put a link to that post. However, do not spam. A few months back, Statcounter was approached by an advertiser, offered lots of $$$, and asked to include a spyware cookie on all of our member sites…we refused on the spot. You install Statcounter to track visitors to your site NOT to open yourself and your visitors up to being spied upon by phantom advertising corporations. We were shocked to discover just today that another well known stats provider is allowing up to 9 cookies to be installed in the browser of every visitor that hits one of their member websites. This means that the provider is making money by transmitting data on you and your visitors to a third party advertiser. Not only that, but to add insult to injury, the cookies are causing the member websites to load very slowly too. In light of this, Statcounter wants to assure you that we track your visitors for you, only you and not any one else. Which provider would you prefer?? Update 6 May 2007: For Statcounter to work, they must put their OWN cookie into the computer so that they are able to distinguish between returning visitors and new visitors. This is not for spying purposes and is completely different from putting a third party spyware cookie. Ramani of Hackosphere came up with what he described as a lightning-fast Neo template with which a visitor can navigate the blog very fast because when he goes to a new page, the entire page wouldn't reload. The sidebars stuff wouldn't reload while only the post and comments are displayed immediately. Also, new comment is displayed before the old comments (the other way around from the standard New Blogger templates) and the comments are divided into pages of 10 comments each, making a huge difference in blogs which received many comments. However, Ramani pointed out some limitations like for bloggers who display AdSense ads will receive very few impressions (plus if that is true, the ads would not change with the content of the post, which will lead to less relevant ads). However, he says he will come up with a solution for that. Update 5 May 2007: Someone commented that the whole page reload and not just the main column, as you can confirm with the demonstratin blog Gizmos and Gadgets. I did mention above that Ramani may do something about it because AdSense user may not be happy with it and that he may do something about it. He must have already done that, but didn't update the post and mention the alteration. I think I will try to contact Ramani to provide 2 versions of his Neo template so that his visitors will get to choose. I have used Ramani's Neo template for this blog: Gizmos and Gadgets and I have AdSense ads in it. Ramani must have made modifications to overcome the limitations mentioned above because whenever I surf to a new post, the sidebars reload and new AdSense ads are displayed. You can test this out for yourself by surfing to different posts of the blog. Ramani used to require USD10 for the template, but has now kindly made it free for everyone. If you want to use the Neo template, surf over to Neo for everyone. You will see a link "Download the Neo template" somewhere in the middle of the post. Right-click on the link and select "Save link as ..." (This is for FireFox. Wordings will be different browsers but will be similar), and download it to a place in your computer which you can locate easily when you need it. For instruction to backup your current template and upload the new Neo template, refer to Backing up the current template and changing to a new template. into the address bar of the browser and press the ENTER key. The window will resize to 800 x 600 and part of the right side of the content will be hidden, and you will see a horizontal scrollbar at the bottom of the page. To see the hidden part, you will have to scroll horizontally to see it. This may discourage visitors with small screen from visiting the blog again, and if a significant percentage of your visitors are using the 800 x 600 screen resolution, you may want to consider using other templates such as the one I am using for this blog (this one uses Ramani's Minima template as described in New Blogger 3 column templates modified by Ramani of Hackosphere (click BACK button to get back to this page. The reasons why I use this template is because Statcounter tells me 5-20% of my visitors are still using the 800 x 600 screen resolution (you can get this from the "System Stats"). Other reasons are stated here: What is the best template for your blog. If you are worried about small screen visitors, you may also consider fluid width templates where the main column width will adjust to the visitor's screen resolution in such a way that the whole width of the blog is displayed. You may find fluid width templates at New Blogger 3 column templates modified by Charlemagne Stavanger. "Yes, it has happened. And they didn't even inform me before doing this. That's why bvibes.com is down and Neo template doesn't work. Don't ever host with A2 hosting. I am going to show them the middle finger and move back to Yahoo. Neo users can pickup the entire Neo script from here, add it to your template and be happy. It will take some time for me to move over the bvibes database and code. So, it maybe down for a few more days. I really don't want to host with them anymore." Note: If you have any problem, just add a comment.